Brazilian Portuguese Voice Prompts for Asterisk, AsteriskNow, Trixbox, Callweaver, Elastix & FreePBX. All sound recorded by native speaking voice artists. Native Brazilian Portuguese voice artist with a professional business voice. 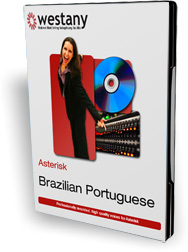 Entire set of Brazilian Portuguese voice prompts for Asterisk, AsteriskNow Trixbox, Callweaver, Elastix and FreePBX. Customised voice prompts can be recorded by the same voice artist for €9.97 each. Alaw, ulaw, gsm and sln sound file formats included as standard. Other sound formats are available on request. Get additional voice prompts to customise your installation. When your customers call, the first impression of your company is the voice they hear on the phone. So selecting the right voice to represent your company is the most important part of your telephone setup. By allowing Leila to handle your calls you get a professional sounding business voice with the accent and intonation to match. Over 600 recorded voice prompts included. The number of voice prompts continually grows as new features get added to and new versions of the software get released. Currently the number of recorded voice prompts is over 600 these include voices for Voice Menus, Call Queues, Follow me, Call transfers, Call Parking, Voice Mail, Transfers, Error messages, Numbers (digits), letters and Phonetics. as well as a bunch of other features. All the flavors of Asterisk, all in one product. Leila contains all the voice prompts for each of the six major Asterisk PBX platforms. Namely Asterisk, AsteriskNow, Trixbox, FreePbx, Elastix and Callweaver. If there’s a feature that needs a voice prompt, then we have it in the product. Every single feature from Automated Attendant, to voicemail, from IVR, to CTI, from Time and Date, to Call Monitoring, from Call Queuing, to Calling Cards, from Call Forward on Busy, to Caller ID on Call Waiting. All the voice prompts are recorded by Leila, who is a native Brazilian Portuguese speaking voice artist. None of the recordings are generated by a text to speech engine (tts) or cut-and-pasted together. So you won't hear a synthetic or unnatural sounding voice. Leila has been professionally recorded in our studio to achieve the maximum quality of both audio fidelity and correct pronunciation and inflection. To maximise the number of simultaneous calls you can make and extract the full power of Asterisk, our voice prompts are provided in multiple sound file formats which automatically match the needs of your installation. We provide the entire set of recordings in alaw, ulaw, gsm and sln as well as other formats such as mp3 on request. All of these formats can be installed at the same time and allow Asterisk to match the voice prompt format to the format of the call. This removes the need for any live transcoding leaving the full power of the computer to handling calls. Easy and fast installation process. To make installation as easy as possible, each set of voice prompts are preassembled into their correct directory structure. Simply extract them from their compressed file and they automatically install into the correct location. An installation guide is provided to help you through installation. Leila can record any additional voice prompts to customise your installation. If you need specific announcements or custom IVR messages we can have them recorded and edited exactly to your specification and match the delivery, pace and pronunciation of the rest of the voice prompts. This ensures a seamless telephone experience for yourselves and your customers. There's no need to wait for your voice prompts to be shipped to you. The sound files are available to download and install a few minutes after your purchase. The voice prompt packs are updated two to three times a year, or more regularly if there is a major update to any of the supported platforms. These updates are provided free of charge for the first year and are provided at a discount for any subsequent year. As new features get released we test the systems for any changes, and schedule any additional voice recordings to be added. Professionally recorded in our top of the range Protools studio. We record everything in our professional top of the line Protools equipped studios. There acoustically designed by professional acoustic architects for accurate audio monitoring ensuring every voice prompt sounds the same on the phone as it does in the studio. Leila contains directory structures for all versions of Asterisk to ensure that the voice prompts are located correctly regardless of which version of Asterisk is running on your system. And here's our 100% Money Back Guarantee!! Buy your Westany voice prompts now and if your not completely satisfied within four weeks you can ask for a full refund. You will receive regular voice prompt updates for free, as new features get added.